In a joint effort with Re-Jig, a recent graduate was employed to prepare an analysis of the potential to convert distillery by-products into biobutanol and assess any associated implications for Islay. This work was in conjunction with Celtic Renewables Ltd and Napier University. A report was completed and is with Celtic Renewables, but is not for publication at this stage for commercial reasons. Meanwhile Celtic Renewables continue developments with their (patented) conversion process prior to any future decisions regarding a development plant and its location. Below is a history of the process……. 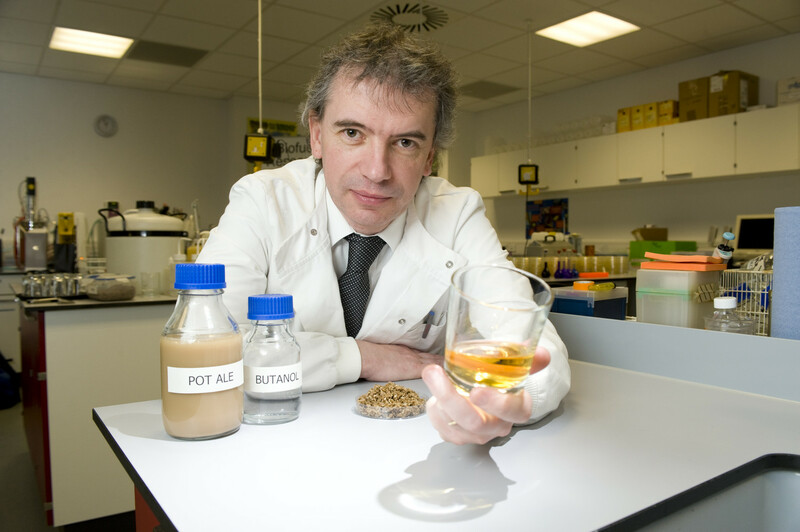 Scientists at the Biofuels Research Centre (BRC) at Napier University have discovered a unique new method of producing biobutanol using the whisky by-products, draff and pot-ale. This is done using a well-established fermentation process known as ABE fermentation, but what makes BRC’s work so pioneering is the use of industrial by-products as a feedstock instead of raw materials. Biobutanol is considered a superior biofuel which can be blended into conventional fuels with no vehicle modifications required, reducing both carbon emissions and the need for fossil fuels. Professor Martin Tangney in the Biofuel Research Laboratory. In September 2012, after successful lab based trials, BRC announced they are now working on a second phase industrial scale pilot plant using the by-products from Tullibardine Distillery in Perthshire, systematically scaling up to 10,000 litre batches. BRC hope that by piloting the fermentation at a commercial scale they will prove the viability of the process, securing accurate information on the inputs, outputs and resulting economics of the system. With nine active distilleries (including Jura) there is a large volume of draff and pot-ale being produced annually, all contained in a relatively small area. This has the potential to be used to produce, amongst other products, a large volume of biobutanol which could then be used to offset the volume of conventional fuel required on the island, reducing CO2 emissions and potentially fuel costs.